Only this spicy and fragrant soup, warm plaid and favorite series can help us survive cold autumn and winter days! Gentle creamy taste, smooth texture, bright colors - these are the three components of the popularity of carrot soup puree! Chop onion and fry in butter until it is soft and transparent. Peel carrots and cut into cubes. Boil carrots and potatoes in the broth until cooked, about 20 minutes. Add onion. Season with salt and pepper. Remove from heat and let cool slightly. Blend potatoes and carrots to puree. Pour the puree to a saucepan, add cream, put on fire and bring to a boil. 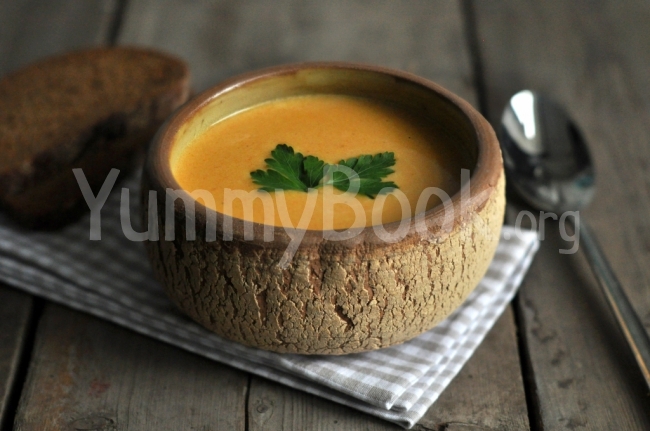 Serve carrot cream-soup with croutons. Bon Appetit!